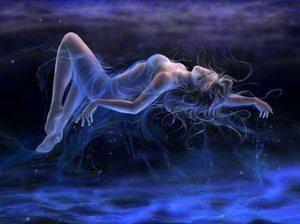 The intense blue background tells you she is at peace with herself and her surroundings. The puffs of white air let you know she is floating on clouds. She hasn’t a care in the world. Her hair swirls about her as she dreams of soothing goodness. Watch her float from your animated desktop.